Sarah-Louise Young is no stranger to the cabaret scene, having written and performed 1-woman shows for over 10 years, guesting with Fascinating Aida and winning awards for her caustic, brittle and sometimes scatalogically funny character of Cabaret Whore. She was also the first hostess of Excess All Areas monthly cabaret showcase and fun competition Cheese-N-Crackers, where all kinds of artists put themselves in the spotlight, from burlesque dancers to very whacky singers and performance poets to vaudeville performers who might swallow swords or even hammer nails into their nasal cavities – not for the faint-hearted! So it came as a surprise to see she was to do a show on the apparently sweet and squeaky-clean Julie Andrews, even doing a whole Christmas season in the West End’s Trafalgar Studios with children in the audience. I saw a Friday matinee with a packed house with, indeed, a number of quite young children, though it is not, nor is it billed as a children’s show. I asked her if she censors any element of the piece when youngsters are in the house, but she does not. There are a couple of instances of fruity language, but these are not sustained, and in the sections of the show where Young improvises, she greets the children personally as Julie Andrews’ singing teacher, helping them to feel at ease in the theatre, and thus implicitly lets the audience know that she is aware children are present and, therefore, relaxing them too. A deft and pleasing touch. Whilst on the face of it this show appears a departure from Young’s usual fare, it is in fact the culmination and bringing together of her different talents and disciplines, being musical theatre, cabaret and improvisation. Young is a member of the improvisational musical theatre group The Showstoppers, which undoubtedly keeps her sharp for this element in her own show, bringing freshness, variety and added excitement to it. It is a long show for a 1-person performance – the best part of 2 hours with an interval. With 8-9 shows a week, I asked her how she takes care of herself. Tributes can be difficult to get right, especially when dealing with an artist of such iconic status as Julie Andrews, where most of the audience have grown up with her, seeing her in the cinema and on TV every year. Some fans are ecstatically enthusiastic and will never forgive a performer for putting her down in any way or seemingly showing disrespect. Others will have been dragged along by fans under sufferance, expecting to have their teeth set on edge by the inevitable “spoonful of sugar”. This show strikes a skilful balance. 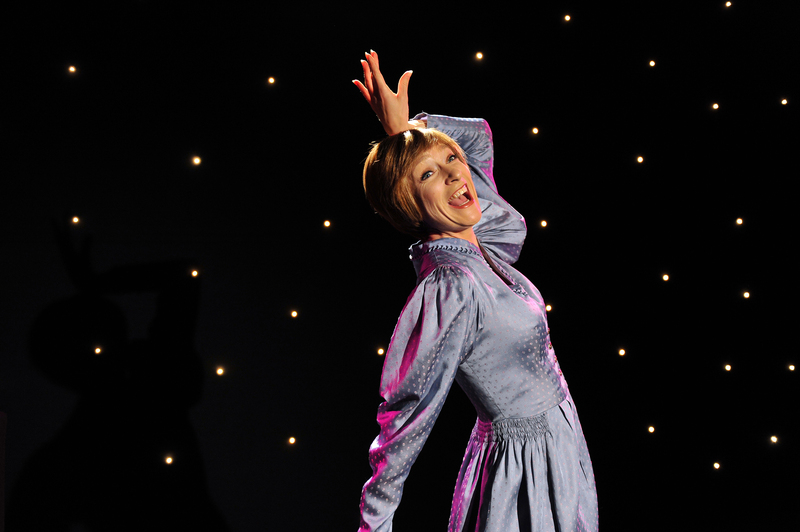 People Julie Andrews came into contact with – directors, producers and other artists such as Liza Minnelli – are brought to life for us, providing variety of voice and sometimes a sharper edge. And on a subliminal level, as Young says: “…it invites the audience to reflect on their own relationship with her and the material”. It also works as a show in itself. You do not need to like Julie Andrews, or to know much about her work, to enjoy this piece. My companion for the evening – hardly a fan of Andrews – appreciated both the content and the craftsmanship of Young herself. It will tour the UK in the Spring, visiting places from Maidenhead to Belfast. For further details, visit the website here – and take some edelweiss. This entry was posted in Features - Theatre and Cabaret News and tagged Cheese n Crackers, Excess All Areas, fiona jane weston, Julie Andrews, Julie Madly Deeply, London cabaret, London theatre, Michael Roulston, Sarah Louise Young, Trafalgar Studios. Bookmark the permalink.